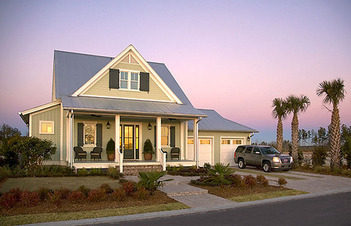 HGTV's Green Home is located a stones throw from Savannah on Hilton Head Island, South Carolina. An island known for it's sublime beaches and it's unusually large population of residents originally from Ohio. The home is a traditionally styled, low-country cottage. The fully furnished home includes three bedrooms and two and a half baths. The designer, Linda Woodrum, purchased a number of items that adorn the house from the boutique I work at in Savannah. The items include paintings by Wendy Martin, lamps, pillows and a variety of other accessories. You can tour the home via the HGTV website or view the on air tour of the home on a special airing tonight at 9pm. Public tours of the home will be taking place in the spring. You can enter everyday for a chance to win not only the home but a GMC Yukon Hybrid worth $850,000, from March 21 - May 9, 2008.